Arizona infielder Mo Mercado makes contact during UA’s 7-3 loss to Utah. Ashleigh Hughes’ skillset lies primarily in hitting for contact and running with speed. 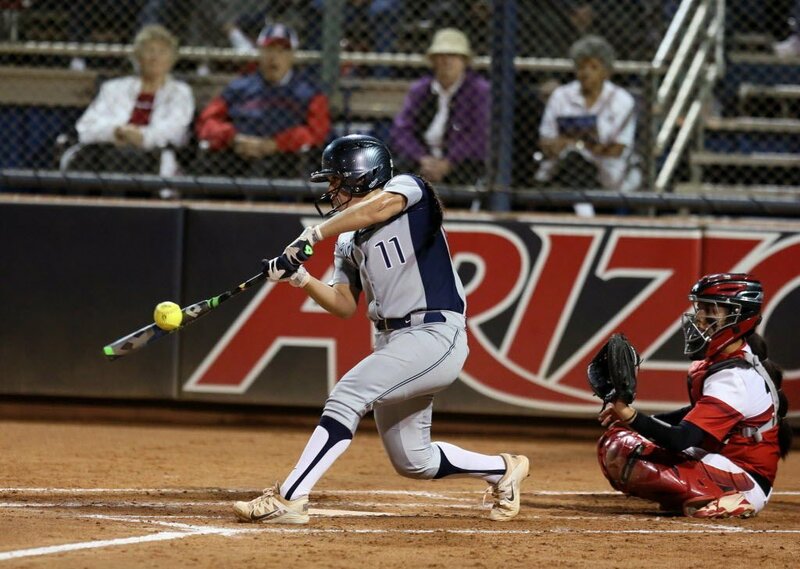 She is not Katiyana Mauga, Arizona’s power-hitting star, and driving in runs isn’t really a part of her oeuvre. Before this weekend’s series against Utah, she had only 12 career RBIs in 64 career games, and she never even drove in runs in back-to-back games in her Arizona career. After Friday night, the perception of Hughes’ game might change a bit. 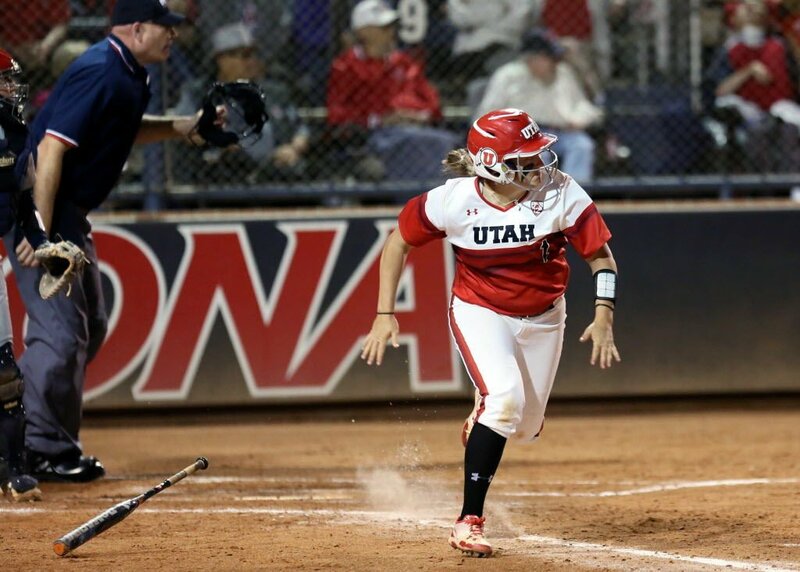 Hughes still might not be a run producer, but if her performance against Utah is any indication, she is capable of producing runs when it counts. Although, it wasn’t quite enough on Friday night in Utah’s 7-3 win over Arizona in nine innings. Thursday night, Hughes drove in the two game-winning runs in a 3-2 win against the Utes. Friday night — rinse, but not quite repeat. In the sixth inning, Hughes hit a game-tying RBI double. This time, her RBI didn’t win the game, though. UA pitcher Taylor McQuillin nearly pitched a complete nine-inning game, but allowed two runs — one earned — in the ninth to clinch the game for Utah, when the freshman was taken out for Danielle O’Toole. McQuillin wasn’t helped by the fact that for nearly six innings, the Wildcats (21-10, 3-2 Pac-12) struggled to move any runners — outside of an RBI from Mauga in the third inning off a Utah error in the outfield, that is. To that point in the game, the Wildcats had left nine runners on base and were 0 for 6 with runners in scoring position. Then, Hughes stepped up to the plate in the sixth with Wildcats on first and third and smashed a double off the centerfield wall, scoring Alexis Dotson. Hughes, who finished 2 of 4 on the night, now has recorded a hit in four straight games, and eight of her last nine to bump her season hitting average up to .290. Arizona was in good position to win the game in the bottom of the seventh inning with Tamara Statman on second base, but on a Joelle Krist single, Statman overran the bag at third and was thrown out. Dotson recorded an infield single on the next at-bat, but Merrilee Miller grounded out to end the inning. For most of the night, it looked like a repeat of Thursday in the way Arizona’s pitching carried its lack of hitting and run production. Outside of the two-run home run McQuillin allowed in the third inning, she was solid for most of the game. As the game wore on, and Arizona still hadn’t made any leeway scoring runs, McQuillin started to slow down a little bit, walking seven Utah batters total on the night, including five in the last four innings of the game. In the ninth inning, McQuillin could only record one out, allowing two hits — including a game-winning RBI single from Heather Bowen — and intentionally walking one batter. She was taken out of the game for O’Toole after a Miller error in the outfield led to another Utes run. All told, McQuillin pitched 8⅓ innings and finished with eight strikeouts while allowing eight hits and three earned runs. Things went awry from there — first, O’Toole allowed a single and then retired a batter. The next play, on an infield hit, catcher Lauren Young had a throwing error on an attempt to first base and three runs scored.